Parmeshwaras--the Absolute has got only One Shakti,but it is fourfold in making the universe exist,and that is Its Vyavahara/natural performance.This Shakti as as Vishnu in the Purusha aspect of reality,as discussed in the Sankhya philosophy. It acts as Bhavani ,while enjoying the merits of actions performed during life.The same Shakti runs as Durga,during war times,and fights through the brave.ultimately,this Shakti absorbs this whole universe into its own creator,which is Parmeshawar--the Avyakta Akshara Supreme sovereign Principle of existence. The Devi, who is adored as Durga is manifested with her effulgence in the form of Shakti. She can be seen through the Tattva Darshna/philosophy of That ness,which Absolute reality, which is the knowledge of the Cosmic Self.When the Devi is approached in the form of Murti/, then She appears to be the Sukumari-- Tripura Sundari--the mother of beauty and excellence. In the Santat Mantra, thou art the essence itself. Some worship Devi--the Divine Mother in the form of Shila/rock/earthly existence and some in the Yantra/Sacred geometry and some in the Chakra/Mandalas. Some adore Durga in the Matrikas of the Maheshwara sutras. Popularly the Divine Mother is worshipped in the form of Shri Durga, who is none else but the संवित् समन्वय रूप--conscious integration of Maha Kali, Maha Lakshmi and Maha Saraswati. To focus on Shri Durga in the Triadic form in One Devi, is verily, an invocation to the Nava Durga. Chakreshwara Puja Viddhi is considered to be the Trayi-Rahasya Puja, as the very theme of the Chakreshvara Puja is the Sapta Shati Hridayam. Hridayam in Sanskrit language means the secret, occult, and the essence. 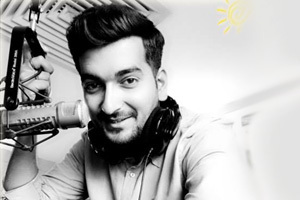 "AUM/OM aim hrim klim chaamundaayai vicche". These are the "Nine seed-syllables "of the Divine Mother Shri Durga"
1. The Devi is to be invoked at the early dawn, after witnessing/ having Darshana/ the Prana Pratishta of the Shaila Putri.Shaila Putri is the Divine Mother Sharika.Shailaputri is in the mystic spring at Baramulla area of Kashmir.The whole world is the very breath of Shri Sharika. It is the physical conscience of the Divine Mother that Shri Chakra is manifested as the Eternal Svayambhu Chakra. She is truly Parvati, the consort of Shiva.Its color is crimson, the earth is her Tattva, and She abides in the Mooladhara Chakra. Her subtle Mantra is "लं"--Lam. It is also known as the abode of Shri Ganesha.She is invoked on the Pratipada-the first day of the Nava Ratra,of the Chaitra Shukla and Ashvin Shukla month of the Vedic Calender. 2. Bhrahmacharini is the cosmic vibration to be felt within Sadhana. The whole cosmic phenomenon is to be realized through the grace of Brhmacharini on the second day. She abides in the Svaddhishthhana Chakra. Its nature is related to the waters. Verily, She is Shri Ragnya Bhagavati. She is invoked on the Dvitiya-the second day of the Nava Ratra. Her subtle Mantra is 'वं"-- Vam. 3. 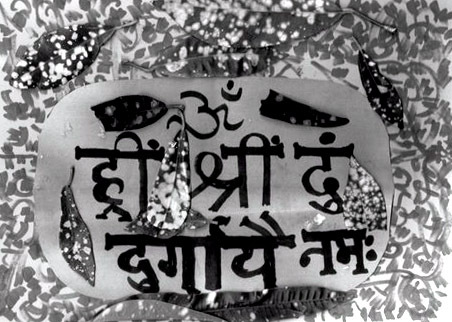 Chandraghanta is the cosmic sound ॐ ऐं AUM/Aim to understand the creation, sustenance and dissolution within Absolute. Bijaksharas are the vibrating forces to feel the vibrations. She abides in the Manipura Chakra. Its nature relates to the forces of stimulating the senses of form and color. Chandra ghanta is invoked on the Tritiya-the third day of the Nava Ratra. . Her subtle Mantra is "रं" Ram. 4. Kushmanda is the universal seed, which is ever conscious. This is the Shudha --Vidya aspect of the Shri Chandi. She abides in the Anahat Chakra. Its nature is Shiva and Shakti and its subtle Mantra is "यं/"--- Yam. 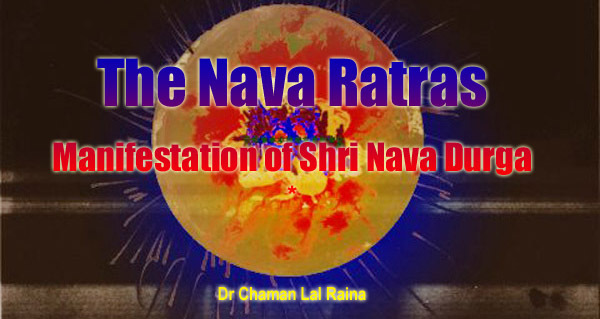 She is invoked on the Chaturthi-the fourth day of the Nava Ratra. 5. Skandamata is the mother of Kumara Kartikeya. She is the power of determination and resolute strength.The Skandamata is the force behind the Skanda--Kumara Kartikeya to annihilate the Rakshasa. Her abode is the Ajna Chakra. It is the union of Shiva and Shakti. She is the source of the sacred movements of speech. She is the Sarasvati / Sharada aspect of the Divine Mother. She is invoked on the Panchami-the fifth day of the Nava Ratra. 6. Katyayani is the daughter of the Katyayana Rishi. She is the mother of excellence, the inner beauty, the inspiration and supreme understanding. She is the Mother of the VAK-the supreme word AUM/ OM of the Vedas or 'Aim' of the Agama Shastras. She is invoked on the Shashti-the sixth day of the Nava Ratra. 8. Mahagauri is having the effulgence of the golden hue. She is what the Hiranya garbha exists for. She activates the Kundalini Shakti within. She abides in the Moola Trikona/ the Primal triangle of the Shri Chakreshvara,which is the Chakraraja Chakra. She is invoked on the Ashtami-the eighth day of the Nava Ratra. She is the Presiding Deity of the Durga--Ashtami. वाहा स्वधा वषट्कार/Svaha--an invocation to the Devatas and Svadha--an offering to the manes.. She is Vashatkara--the mystic syllable and sound. And above all, Shri Durga is the source of life for Brahma, the creator. She is All realms of existence---the secret soul. She is the Mother of the Universal flux,in the Eternity of Time. A Homa is being conducted to offer the Ahuti of unbroken rice, sesame, ghee, barley with the recitation of the Seven Hundred Shlokas, after doing the "Kanya -Puja" , on the Ashtami Tithi/ day. On the Navami Tithi1/10th of the Tarpana is to be offered and 1/10 th of the Japam is to be offered to the Divine Mother Shri Chandi,during the Agamic YAJNYA/ Havana. The video represents a synopsis of the Chandi Homa Yajnya. In all seven hundred Shlokas of the Saptashati are to be recited during the Aahuti offered to Shri Durga. The Mantrik word is said to be the "SAMPUTA Shabda" according to the Shakta point of view. How? Samputa means sacred within a wrapper--hidden by a cover. Highly secret, within name and form. 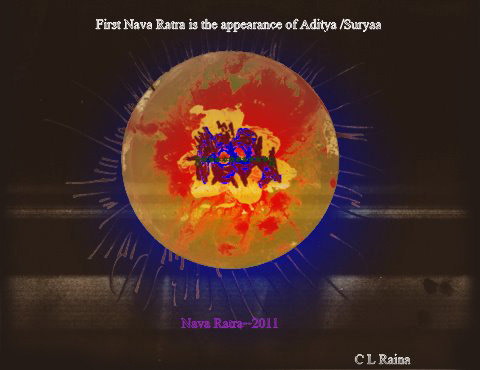 it is the mystic lotus of the Bija Mantras.But its effulgence can be realized as the Surya .Hence Devatas are adored as the Aditya, as all the Devatas have been created through the Ichha- Shakti of Hiranya Garbha. The Devi Atharva Shirsha speaks of Twelve Adityas, which govern the solar system and keep the universal flux in seed/ Adi Bija, sound / Adi Shabda and syllable/ Adi Akshara, through the Prakash--Eternal light. The Devi Bhagwatam and the Markandeya Purana say about the Rahasya Traya /triple secrets of the Devi Mahishasura Mardini. The Devi reveals her own nature Herself. This is the beauty about the secret of the Maha Maya. “I am Mother Durga-the Divine Energy. You can have my Saakshat/communion, through the Vision of Medha Rishi. 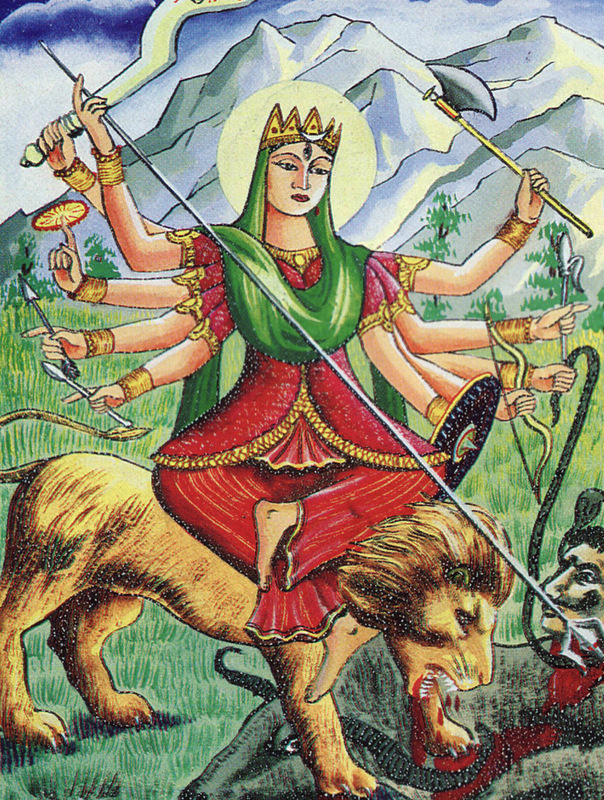 I am Chandi Devi–the Durga Sapta Shati, and can be seen through devotion. The narration of the Medha Rishi is the Divine revelation, as I myself revealed myself to the Rishi. 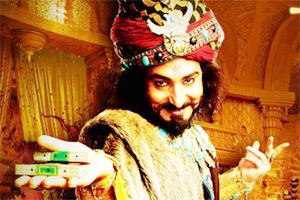 King Suratha is just the Rajasic incarnation. Samadhi Vaishya is but a Divine observation, who excelled in his devotion. I am vital breath in all the creatures, and I fill the universe with celestial treasures. I alone exist, Shiva could perceive it in his Tandava dances. Markandeya understood the nature of perception, mental fluctuations,and observed my being in touch, taste, smell, sight and sound, which are merely the body functions,to maintain rhythm and balance of the physical emotions. I myself am the Atman/ Brahman. I am the eternal spirit revered as Vishnu Maya, though I am Unborn. But I am omnipresent and omniscient. I am Maha Kali-the eternal Time and time based trigger. Measure of the time, is my Lila.--the Divine play. I create aeons, years, months, nights and days. I rise with glaciers, peaks and beautiful valleys. Devotees can find me in mountains, jungles and trees, in the Shailaputri manifestation. I am the graphics of the universe. I am curve, triangle, square and process of reduction, in the Yantras. I paint with Divine brush and cosmic colors, to give Shades and tones to the manifestation, which is Prakriti. The realms of Brahma, Vishnu and Shiva,are just the glimpses of my Ichha Shakti/Primal thought. 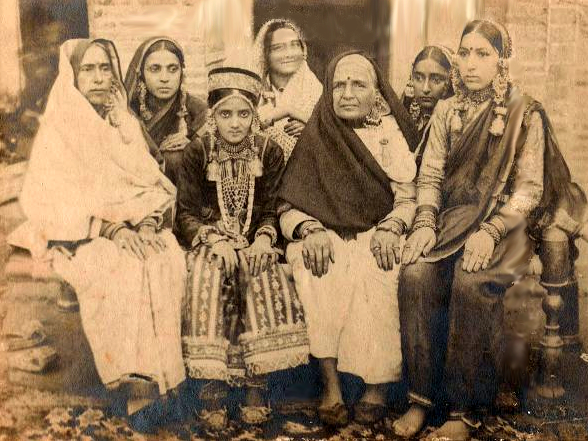 Thus I am revered as the First Brahmacharini. Being Durga, I am Existent the Eternal one. I am embodiment of creation, sustenance and dissolution. I am visible to Markandeya’s intuitive vision, which is the Yogic Tri--Netra. It was because of my will power that the Rishis deciphered Devi Beeja Mantra in syllable, word and meter, who adored me with the Gayatri- Anushtup- Ushnik meter. The Devatas offered 36 weapons and missiles in my hands.and a lion was presented to me , to be my vehicle by the Himalayas. All the Divine forces see me manifested in Nine Virgin forms.Thus I am adored as the Nava Durga. I alone give a vital breath to Lord Vishnu and Ananta serpent is his couch then,. He was commissioned to give birth to Brahma through his naval root, Simultaneously Madhu and Kaitabha were born and seen by Brahma. They were born of Vishnu’s ear –wax, and hastened to kill Lord Brahma. I bring luminosity around the globe, through the Ananda Nritya of Shiva. It is just a twinkle of my eye, to keep Nine planets in harmony and movement. Brihaspati is my intellect, Shukra is my ego, and I keep Surya as statis. *Dr. Chaman Lal Raina did Masters in Hindi & English. Ph.D. in Hindi & Iqbaliat at the University of Kashmir. Worked on the research project at the Iqbal Institute for writing monographs on Indology as Research Associate. Worked as lecturer to teach research methodology in Iqbal Institute, University of Kashmir. Dr. Raina's first love is for the Vedas and the Shakti Tradition of India. To his credit goes some ten books on Indology. He was awarded Nagmani Fellowship, Buddhist Fellowship etc. from various Institutions. 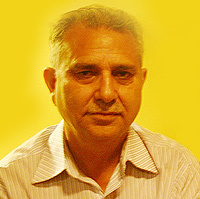 Presently Dr. Raina is associated with the Yoga Studies, religion and sanskrit at Florida International University, USA. Thanks for this great very informative article. Hope that Shehjar will bring such knowledgeable information on all our rituals and festivals. Very informative and enlightening article.Lucid in many details, even for the un-initiated. Only an indepth and wide ranging study done by Dr Raina could have produced such a work.